Discovered by chance in 1903, and explored in a series of digging campaigns until 1967, the Anghelu Ruju site houses one of the largest prehistoric cemeteries in Sardinia in terms of the number of tombs found up till now. 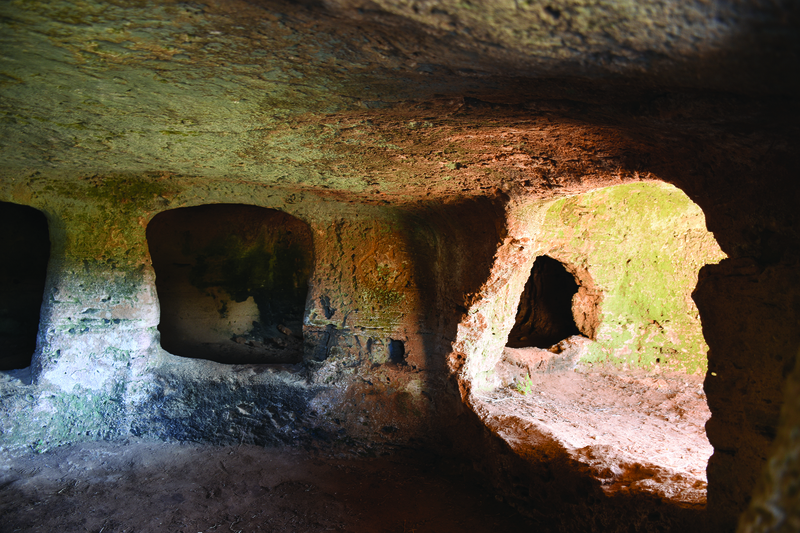 Nearly 40 artificial caves (the famous domus de janas) carved in a rocky ledge of soft sandstone used by different cultures starting in the Late Neolithic and going on until the first Bronze Age. A first-rate archaeological site, which is mysterious and fascinating, takes visitors to a place where the respect for the cult of the dead blends with the respect for nature that these peoples had and which still comes across unchanged even today. In some places you can still admire enigmatic symbols of propitiatory rites and typical elements of the religions of the Neolithic period because of the presence of bas reliefs and carvings on the wall. The architecture of these eternal abodes is often decorated with details inspired from the homes of the living (steps, pillars, cornices, false architraves, false doors, false windows, etc.) and the moss that now covers the walls, nowadays lit up by the sun rays that creep through and warm up the hard stone at that depth where darkness doesn’t mean lack of light, hides traces of red ochre, as red as the blood which symbolises life. And it is precisely within these little recesses hewn into the womb of Mother Earth that the dead were interred with the objects that were useful and dear to them in life, ornaments made out of stone and shells, vases and stone or bronze utensils and feminine idols who were to have accompanied them in the journey to the other side. There is also evidence to show the habit of eating funeral meals inside the recesses or near the tomb entrances in honour of their loved ones. Of particular interest is tomb A which has a door that is finely sculpted in the rock, with a false, raised architrave, on which you can admire the famous taurine protomes or bulls’ heads, representations of the male divinity that was loved by the ancient peoples. There is also tomb 28, with carvings alongside the door of the main recess of the symbols associated with the divine “bull-mother god” couple, two schematised bull protomes with double horns in a rectangular form with carved concentric circles inside. The whole complex is located at I Piani, 9 km from the sea in an extensive plain washed by the Filibertu River. The findings are housed at the Archaeological Museum of Cagliari and at the new Museum of the City of Alghero. How to get there: from Alghero you take the SP 42, the so-called “road of the two seas” towards Sassari-Porto Torres. After six km, on the left there is a large unsurfaced parking lot where the entrance to the necropolis is located. Full-price adult ticket for two parents and free entry for up to three children (up to age 14). A reduced-price ticket must be bought for each child beyond the first three. The Family ticket is valid for all the museums, exhibitions and towers except for large exhibitions and Neptune’s Grotto, for which special Family Days will be organised with special offers.